How, realistically, can Jewish heritage be preserved in Poland? 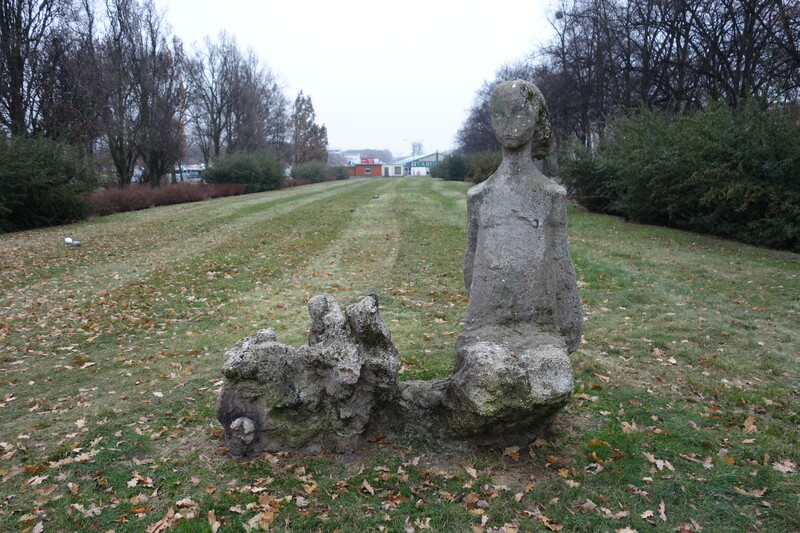 Some projects are easy to get behind, like the lapidarium in Wronki. Others fall into more problematic ethical territory. The fact remains that there are many more sites in need of preservation than there are funds for such projects. And yet, I would argue that because of the magnitude of the destruction of Jewish life in Poland, every fragment has enhanced value. The survival of a building as grand as the New Synagogue in Poznań is thus of particular worth. As with most remaining synagogues in Poland, the New Synagogue was not destroyed because it was repurposed. The Nazis converted the building into a swimming pool; after World War II, it remained a municipal pool until 2011. Although there has been ongoing public debate about more appropriate uses of the space, which at some point was passed back into the hands of the Jewish Community, the main reason the pool was finally closed was because of its deteriorating condition. The New Synagogue was built in 1907 on Stawna Street between Wroniecka and Żydowska (Jewish) Street, just a few blocks from the central market square of the old city. Intended for Poznań’s wealthier Jewish citizens, the imposing structure had a seating capacity of 1200 and a large copper-covered cupola. Its size and grandeur is all the more striking, considering the Jewish population of the city was under 6000 when the synagogue was built, and further dwindled to perhaps 3000 right before World War II (statistics from Virtual Sztetl). As these photos show, the German occupiers also removed the cupola and other ornate features, leaving a far less elaborate structure. For several years, starting in 2004, artists like Janusz Marciniak were involved in installations and commemorative events that used the pool as a focal point. Some of these include Marciniak’s Atlantis (2004), Alphabet (2005), and 9/09/1939 (2006). The Jewish Community, together with others interested in preserving the New Synagogue, proposed restoring the building to its prewar shape and condition, and housing a Center for Dialog and Tolerance. Unfortunately, the plan failed to gain the institutional support and financial backing necessary for it to be realized. But now there is a new plan in the works, to turn the synagogue into a hotel. 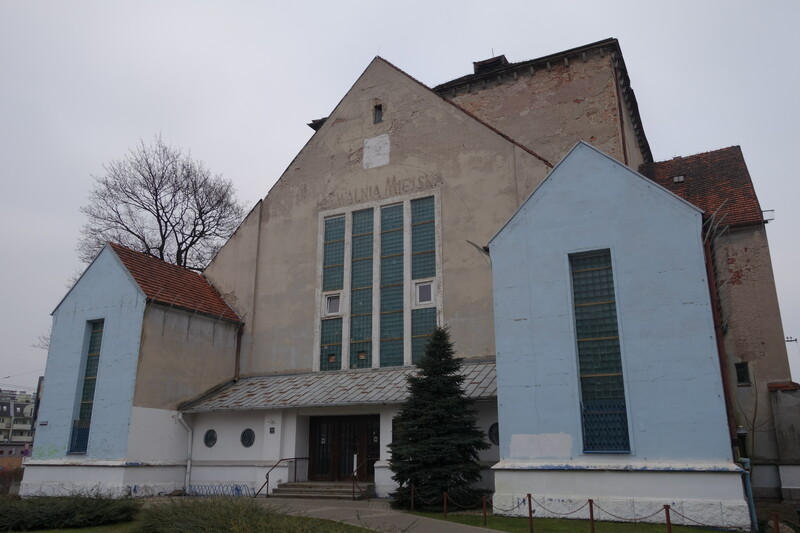 In and of itself, that is not the worst outcome; investors will preserve and upgrade the structure, which will include a mini-museum with information about the building’s origins and the history of Poznań’s Jews. So while a museum, or memorial, or center for dialog and tolerance would be preferable, at least the synagogue won’t be torn down, as some city leaders suggested as recently as 2006. But putting another pool in the synagogue is, as my husband put it, kind of tone deaf. It’s insensitive to the cruel history of the place. (my translation) “Summer 2020. Early morning at the hotel on Wroniecki Street at the corner of Stawna Street. In a luxury room in the former Jewish synagogue Alessandro Gianini, a tourist from Rome, wakes up. He flew into Poznan the night before and stayed in the modern hotel with intriguing architecture. In the guidebook, he read that the glass copula of the building recreates the old outline of an imposing synagogue. Now he wants to look around the city. “Intrigued, Gianini looks inside. He sees large boards–reproductions of sepia-colored photographs. 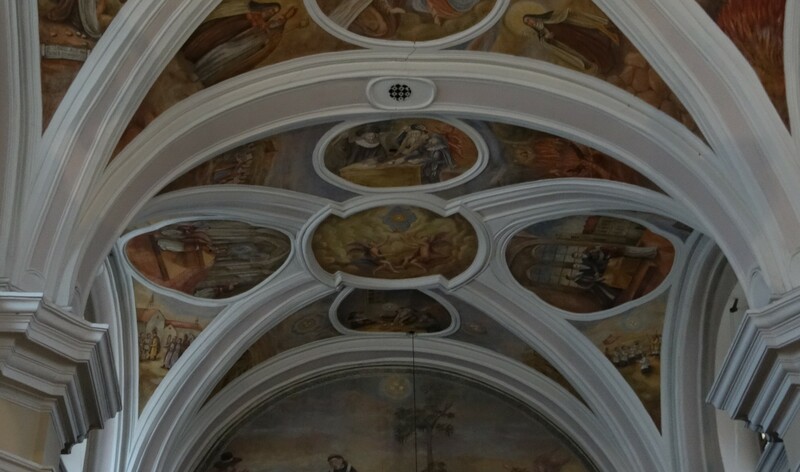 On the first of these–a long swimming pool under a high vaulted ceiling. On the wall of the pool–a fascist eagle. “Surprised, the Italian looks at the caption below the photo: “In 1940 Nazi occupiers profaned the synagogue, removing the Star of David from it and building a pool inside of it. I don’t know anything more about these plans, except for rumors I heard while I was in Poznań last year, and the contents of this article. Perhaps if they do include a pool, it will be located in some new addition to the structure, in a less offensive place than the main sanctuary. I certainly hope so. The lecture I gave at UA September 3, 2015 about my research during my Fulbright Fellowship is now available on vimeo. I’ve never seen myself lecture before. It’s a little unsettling. Still, here it is, flaws and all (for instance I know that Poland entered the European Union in 2004, even though I misspoke here). I talk a little about the Fulbright Program–the kinds of grants available and some tips for applying. It’s also a good introduction to my ideas about reassembling Jewish life: the strands that I’m following, what has been lost, what can be recovered, and how memory projects at sites throughout Poland intertwine with my own search for my family history. I hear echoes of some of the scholars I’ve read–Iwona Irwin Zarecka and Marianne Hirsch, as well as my sometime collaborator Malgosia Wosińska. There is no way to bring back what has been lost, but fragments of the past can be reassembled to form a new kind of life that allows for connection with what used to be and what yet might be. 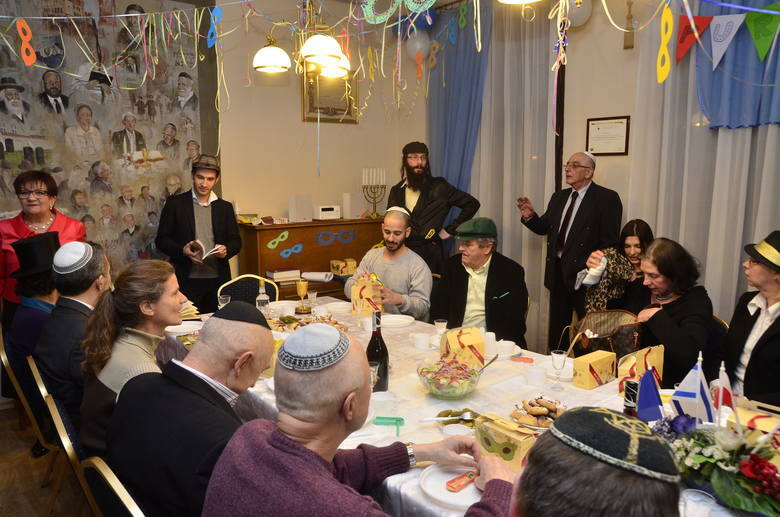 As I look forward to the Passover celebration at the Gmina Żydowska (Jewish Community) in Poznań, I’m remembering Purim which occurred last month. Purim is a fun holiday; people dress up, give gifts, and tell the story of Esther who outsmarts the evil Haman and saves the Jews. The celebration also involves feasting and drinking. The evening started with a brief introduction to the holiday, conducted in the form of questions and answers. 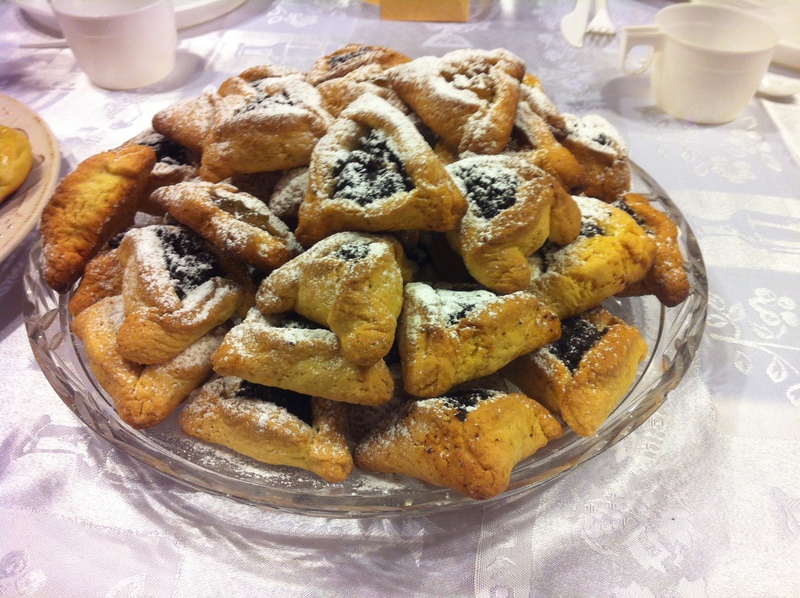 Purim is celebrated on 14 Adat (on the Hebrew calendar) in most places, on 15 Adat in walled cities. I learned that Purim is particularly associated with Jerusalem, which is why holiday preparations were already in full swing when I was there in February. The candy stores, basket sellers, and costume shops in the Mahane Jehuda Market were busy with customers. Four things should be done on Purim; the story of Esther is told, donations are given to the poor, presents are given to family and friends, and you are supposed to have fun. 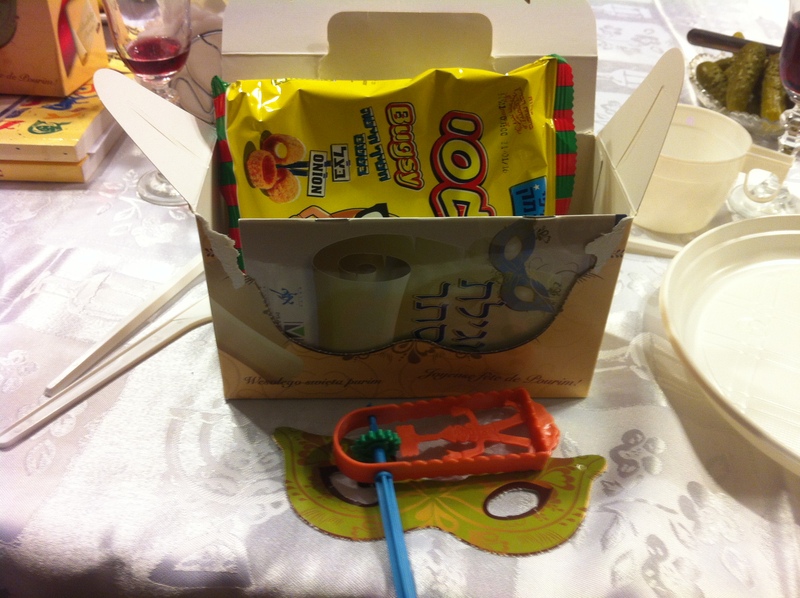 Everyone was given a gift box that included a booklet in Hebrew, a noisemaker, toys, and snacks. Copies of the story of Esther were passed out, and participants took turns reading it out loud. Any time the name “Haman” was mentioned everyone stamped their feet and sounded their noisemakers. Haman was advisor to the Persian King Ahasuerus who conspired to kill the Jews, but he was outsmarted by Mordecai and Esther, Queen of the Persians. Celebration and feasting are supposed to commemorate these events. Guests filled two long tables; some wore funny hats. There were visitors from Israel, Germany, and the US, and I sat beside Jose Maria Florencio, conductor for the Pomeranian Philharmonic in Bydgoszcz. A native of Brazil, he came to Poland 30 years ago to get a masters degree and never left. After discovering his crypto-Jewish heritage, he converted and is now a practicing Jew. Głos Wielkopolski published an article with more photos. 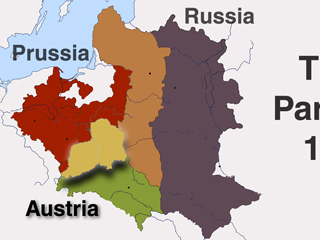 Regions in Poland still reflect the different administrative regimes within the Russian, Prussian, and Austrian Empires that controlled Polish territory from the late 18th century until World War I. 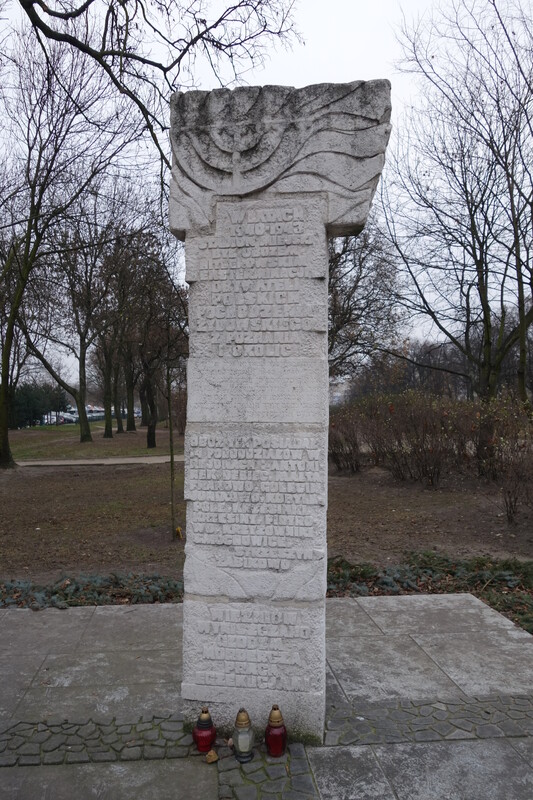 The experience of Jews in Poland varied across these boundaries, as well. It’s a bit like the continued influence of North-South differences in the US, particularly with regard to African Americans’ experiences. History can dig channels that influence the flow of events far into the future. Wielkopolska Province, where I’m living, was under German/Prussian control during the period of partitions. Older residents in particular tell me this German influence has contributed to the region’s sense of order and relative economic success. Historically, regional residents were more interested in taking pragmatic steps to improve daily life (what has been called “organic work”) than in romantic battles for independence that were destined to be defeated. Some refer to this region as “Polska A” in contrast to the more backward and poor “Polska B” in eastern Poland. Some also complain that in recent years state and EU funding have tended to go to other regions of Poland, and that this is a residue of outdated perceptions that Wielkopolska is the least in need of development aid as well as distaste for the German influence that makes some consider the region “less Polish.” Channels can be redirected. The highest percentage of Jews in Wielkopolska dates back to the first half of the 19th century. Jewish outmigration after then has been attributed to a number of factors. The first is economic; Jews saw more opportunities for themselves in larger German cities. They had often been educated in German schools, spoke German, and could move west without crossing political borders. Second, the German state offered rights of citizenship for ethnic and religious minorities. Many saw more opportunities to study at universities and build careers or businesses in what they perceived as the more developed west. Third, especially from the late 19th century and continuing when Poland regained independence after World War I, Jews were escaping growing Polish anti-Semitism. The National Democrats, with their platform defending the purity of the Polish state against ethnic and religious minorities, were particularly strong in Western Poland. Many Jews continued from Germany to the United States, chasing the promise of greater social equality as well as economic opportunities. In the interwar period, Palestine became the preferred destination. By the time World War II started, Jews constituted a tiny proportion of the population of cities like Poznan and towns like Wronki. In Poznan, there were maybe 2000 Jews, while in Wronki there were perhaps 30. This early emigration and the small numbers affect the kind of memory work that can be done in Wielkopolska. Many Jewish institutions (hospitals, schools, and even synagogues) had already closed their doors well before the war; Jews were less visible for the Poles who remember prewar life. There is another issue that has tended to limit Polish scholarship about the Jews of Wielkopolska. They often identified more closely with German culture than with Polish. This is visible even in the material fragments that have been recovered. I am thinking for instance of tombstones commonly inscribed in Hebrew on one side and in German on the other. So overall, the fragments of Jewish life in Wielkopolska are older, the memories are more distant, and fewer residents have had direct experiences with Jews and Jewish culture. These factors pose a challenge to heritage work—it can be harder to find artifacts worthy of preservation, and more difficult to convince local residents and funding sources that these stories need to be told. I’ve read and talked to a lot of people about this, but thanks especially to Tomasz Kawski for explaining it so clearly. A defining question of my study is turning out to be: How do you remember Jewish lives in Poland when nothing remains? Or when there are only scattered traces? I certainly started with next to nothing when I began the search for my own family story. Since then, I have found so much—most extraordinarily many living relatives. I’m gathering up the fragments of the past—a half remembered story, a photograph, a birth record. And pieced together, something fuller is emerging. It’s still impossibly far from the rich lives that have passed, but it nevertheless gives me a much better sense of where I come from. All this resonates with an article I read in the Atlantic, which although it is about the tension between science and belief in God, makes the point that the more knowledge we gain the more we become aware of how much we still do not understand (“Why God Will Not Die” by Jack Miles, December 2014, pp. 96-107). Miles explains, “Scientific progress is like mountain climbing: the higher you climb, the more you know, but the wider the vistas of ignorance that extends on all sides” (p. 100). Maybe this is what my search is destined to be like. Every relative I find points to many more ancestors and descendants who remain to be discovered. Every historical artifact hints at another vast realm of Jewish culture that remains hidden. So how do you remember Jewish lives when nothing remains? When I met pani Alicja Kobus, the head of the Gmina Żydowska (Jewish Community) in Poznań, she told me about numerous ways in which the Gmina has fought to commemorate Jewish heritage throughout the region. Pani Alicja calls herself a bulldozer; she keeps at it no matter what obstacles she faces. She doesn’t give up. She also attributes her success to cudy (miracles), and to the material and spiritual support provided by numerous allies. Among the projects she described to me, one stands out—the reclaiming of a section of the Jewish cemetery. The story is pretty extraordinary. 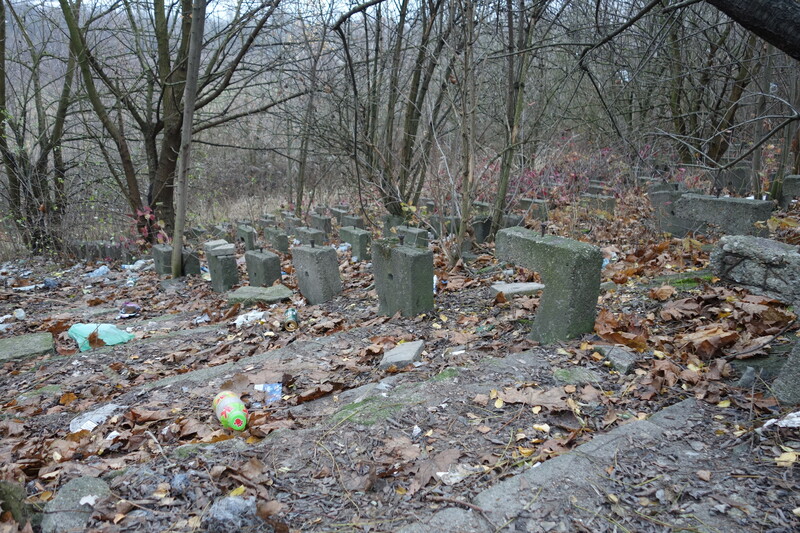 The Jewish cemetery on Głogowska Street was established in the early 1800s, in what at the time was the outskirts of the city. 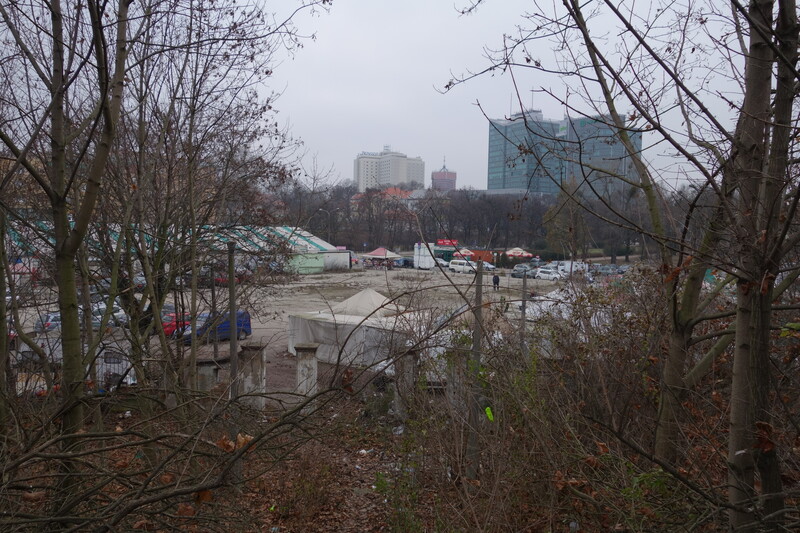 The Poznan city leaders liquidated a number of cemeteries in the city center, including the old Jewish cemetery near what is now Plac Wolności, so the city would have room to expand. A photo taken in 1927 (on the webpage of the Poznańska Filia Związku Gmin Wyznaniowych Żydowskich w RP/ Polish Branch of the Union of Jewish Communities in the Republic of Poland) shows the Trade Center in the foreground and the Głogowska Street cemetery in the background.The cemetery was devastated by the Nazis during World War II, and the tombstones were either destroyed or carted off for construction projects. During the communist period, the adjoining Targi Poznańskie (Poznan Trade Center) was expanded into the former cemetery site. Pani Alicja says it took something like eight years to create a memorial at the cemetery site. She focused her energies on a strip of land between some apartment buildings and the Trade Center, where a row of mismatched, ramshackle garages stood. 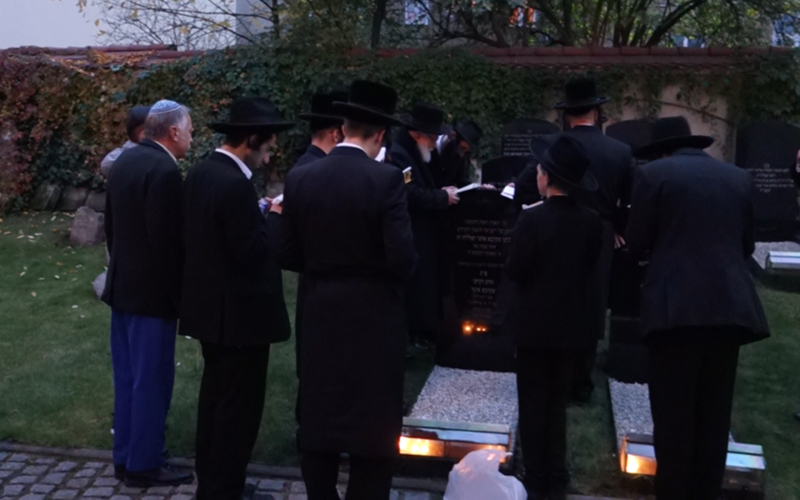 Reclaiming the space for a cemetery memorial required the support of city officials, local residents, and international interest groups, including the descendants of Rabbi Akiva Eger, a highly regarded Talmudic scholar who was buried in the cemetery in 1837. As pani Alicja tells it, opponents to the project were slowly persuaded, or they met with misfortune. 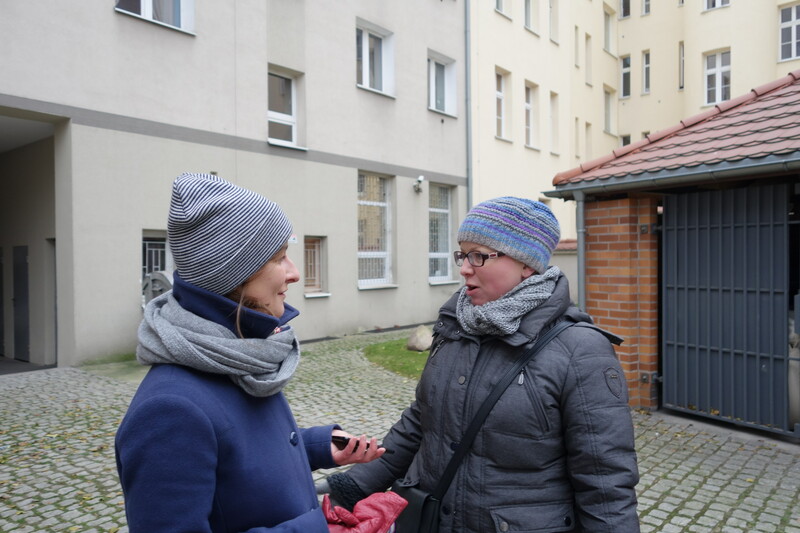 One elderly woman refused to sell her garage, saying “I don’t want Jews in my courtyard.” Alicja responded, “You already do have Jews in your courtyard” (pointing out that the whole space was within the cemetery grounds). Not long after, the elderly woman passed away. A member of the city government who opposed the project got caught up in a scandal and resigned. Other residents were swayed by the promise that the neglected space would be renovated, with new gates and building facades. Finally, in 2007, the commemorative site was completed. The memorial site is hard to spot from the street. The best clue is the Stars of David that ornament the new metal gates closing off the courtyard from the busy street. Inside the gate, granite plaques mounted on the archway wall outline the history of the cemetery, the rabbis who were buried there, and the international sponsors of the project (Committee for the Preservation of Jewish Cemeteries in Europe, and the British descendants of Rabbi Eger). The text is repeated in Polish, Hebrew, and English. 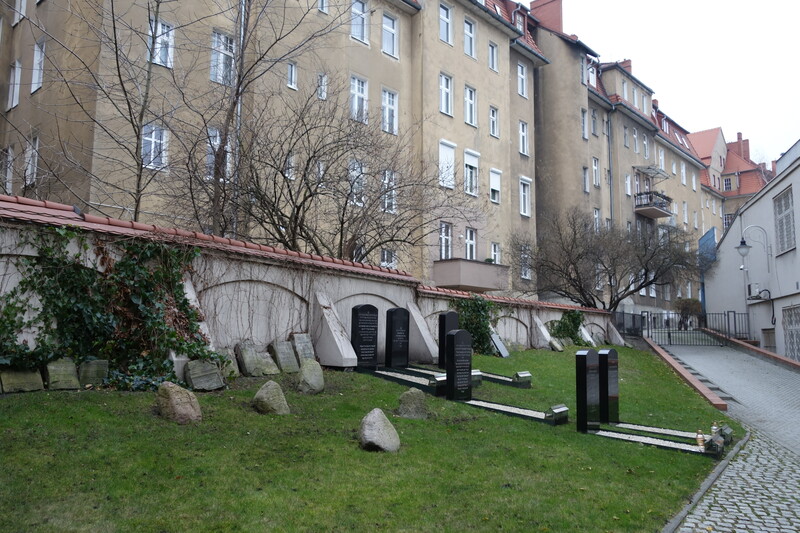 In a narrow strip of grass sloping up to a plaster-covered brick wall (where the garages used to be) stand six tombstones commemorating Eger, his wife, and other descendants who were also rabbis. The black stones are inscribed with Hebrew writing. White gravel fills a rectangle in front of each stone, the foot marked by a metal roofed glass enclosure for candles. Old stone tombstones lean against the wall, while a few stones with large, rough writing are scattered on the grass. These grave markers were found around the city, many dug out of roadways and other wartime construction projects. The site is closed to the public because it is in a private, locked courtyard. The first time I visited was when rabbis and others came from Zurich and England to say the kaddish on the anniversary of Eger’s death. They gathered around the grave and sang and prayed for about an hour, nodding as they read in unison. The visitors were all male; they wore black hats and long coats, their payot curled in front of their ears. Observers from the Poznan Jewish Community watched at a respectful distance, except for a few key members including Pani Alicja who stood with the visitors. It struck me that throughout the kaddish, I didn’t see a single resident of the surrounding buildings. As it got dark, I could see the lights in many apartments. Didn’t they hear the singing? Weren’t they interested in what was happening right outside their windows?